Worn fuel pump components like valves and bearings and problems in the pump electrical circuit can cause low or high pressure in the fuel system. However, these components are not the only ones that may create these symptoms. Before blaming the fuel pump on your Dodge Caravan, check for leaking fuel lines and hoses, a clogged fuel filter and poor electrical connections. 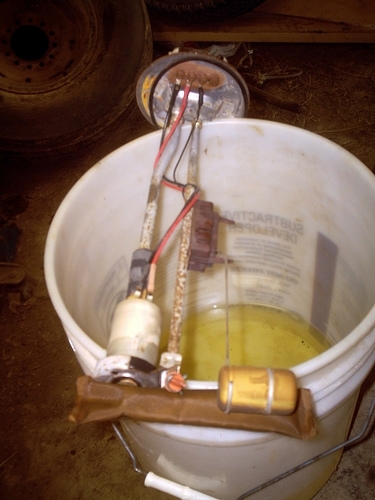 Then test the fuel pump and replace it if needed to restore the fuel system on your vehicle. 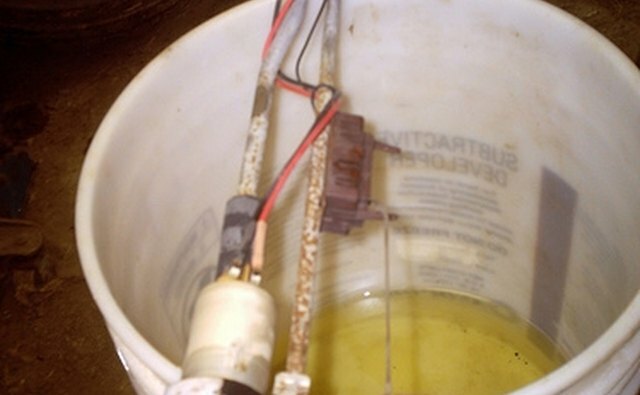 Before testing the fuel pump, check the fuel filter first. If you have not replaced it in more than a year, it is possible the filter is clogged and restricting fuel flow. Remove the filter and carefully blow through the in-line fitting. If air does not flow easily, install a new one. Then check the condition of fuel lines and hoses to make sure there are no fuel leaks. In addition, checking the fuel pump pressure will help determine whether you actually have a problem in the fuel system. Worn pump components or faults in the electrical circuit of the fuel pump may cause fuel low pressure. High pressure may come from not only a failing fuel pump, but also a bad fuel pressure regulator. Use a fuel pressure gauge to test the fuel pump following the instructions on your vehicle service manual, or take the vehicle to an auto shop for this test. If you determined the fuel pump needs to be replaced and plan to do the job yourself, relieve the fuel system pressure first. This can be done by removing the fuel pump relay inside the Power Distribution Center [PDC] located inside the engine compartment. Now start the engine and let it stall. Crank the engine again to get rid of the remaining pressure. Then turn off the ignition switch and disconnect the ground, black battery cable. To reach the fuel pump, you will need to lower the fuel tank. If necessary, remove fuel from the tank using a hand siphon pump into an approved container. Loosen the fuel filler cap, lift the rear of your Caravan with a floor jack, and support it on two jack stands. Chock the front wheels and apply the Parking brakes. After disconnecting the fuel hoses and the fuel pump electrical connector at the fuel tank, lower the tank. Now you can release the module locking ring that holds the pump assembly using a brass punch and a soft hammer. Punch the ring at the tabs to turn it counterclockwise until it is free. Then lift the module off the tank. Once outside the vehicle, you can replace the pump. When installing the module back in the tank, use a new module O-ring seal. Then turn the module locking ring clockwise, using the brass punch and soft hammer until the ring tabs hit the stops. Connect the fuel hoses and plug the pump electrical connector. Lower the vehicle, refill the fuel tank and tighten the fuel filler cap. After connecting the ground, black battery cable and the fuel pump relay, pressurize the fuel system using a scan tool following the instructions provided in your vehicle service manual. If you do not have one available, you may be able to rent a scan tool from your local auto parts store. Use this tool to erase any Diagnostic Trouble Codes [DTC] as well. Removing the fuel pump relay may have triggered one or more DTCs that need to be cleared from the computer memory.